We all know “continuous improvement” is easier said than done. There are always things we need to improve and so many CAPAs we need to create and follow-up, that the sheer volume of it becomes a challenge. Creating a new CAPA has been kept simple but compliant according to the ISO standards. Besides providing your CAPA with a title, a due date and assigning the relevant people to it, you simply define your CAPA plan in a free-text field. As soon as the CAPA plan is ready, you submit it for approval. 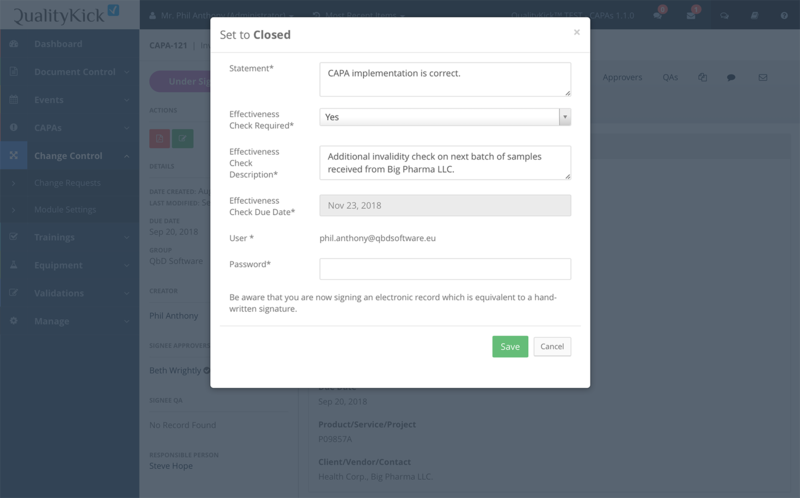 When a CAPA is submitted for approval, the right persons get an automated email notification to approve the CAPA plan after which the status is changed to: Implementing. You can configure if only 1 approval is needed or if all approvers need to sign off. 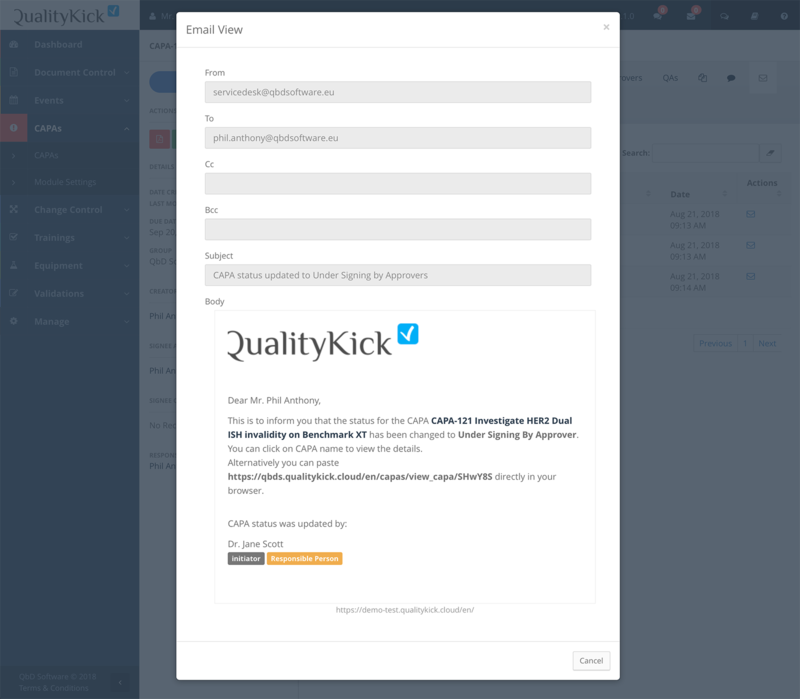 Note that all email notifications sent from QualityKick are saved and can be viewed from within QualityKick. Just like CAPA creation, the implementation of a CAPA has been kept simple, too: you simply register performed actions in a free-text field, select if all actions were executed successfully and push the CAPA to the next status for review. If, however, you need a more sophisticated workflow and would like to assign specific tasks to employees, that’s possible too! In that case, you can create a change request in the Change Control module and link the CAPA to it. When QA closes a CAPA after its implementation, they can decide if an effectiveness check is required after a certain period of time. What the check consists of can be defined and a due date can be given. This way, QualityKick will take care for you of notifying the right people about this requirement. They will be reminded to perform the checks at the right time so you don’t have to. After providing the necessary proof and the CAPA is finally closed, you can be certain that the CAPA was successful with the minimum amount of effort. On the one hand, the Events Module allows you to find out where things go wrong. On the other hand, the CAPAs module helps you to implement improvements. Additionally, the Change Control module provides you with the means to implement larger changes in a controlled manner. There’s no doubt, linking these three is essential to close the continuous improvement cycle and QualityKick enables you to do just that. Ensure that the quality improvement decisions you make through the creation of CAPAs is done efficiently and reliably. Be confident that CAPA follow-up will be relentless until its closure. Have your CAPAs under control through a simple, yet compliant, system which automates part of the process. Define, implement and check the effectiveness of CAPAs while involving the right persons at the right time in a fully automated way. You can configure the CAPAs module in just a few minutes and start working with it right away. We will actually do that together with you while we explain the different configuration options. Your annual QualityKick cost depends both on the amount of modules you use and the amount of users you create. But you can further keep costs down by activating the CAPAs module only for users who are allowed to create and implement CAPAs. 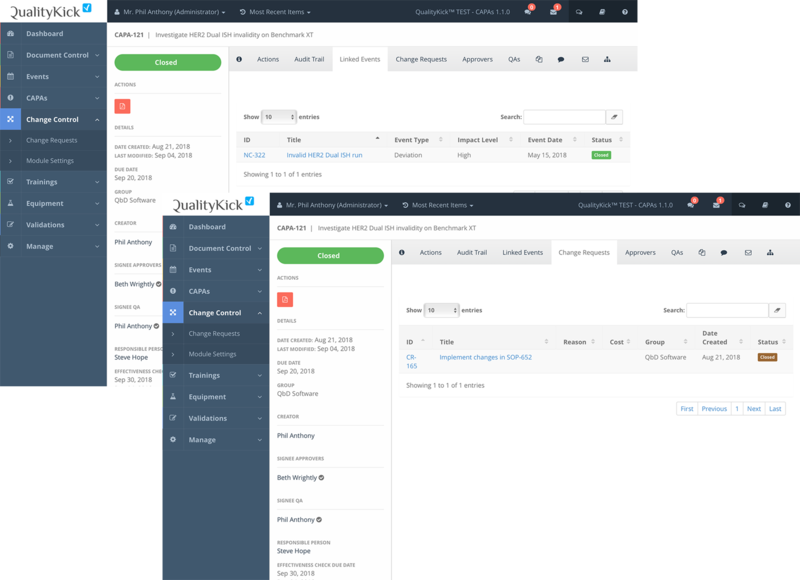 Since we use QualityKick in our company I notice that I’m more precise with the documentation I provide for CAPAs or events in which I’m involved. The reason for this, is that it’s easier for QA to reject something until it’s perfect. This may sound like a bad thing, but it’s obviously good from a quality perspective. The best thing about QualityKick is that now we have all quality related information in the same place. This has been a huge improvement for us as we came from a paper-based system. Besides that, the application in itself is really easy to learn and use. I use mostly the CAPAs and Events modules in QualityKick. What I like about these modules is that it enables us to keep a very good overview of all these quality related tasks and improvements we need to keep track of. Without QualityKick this was a bit of a mess. What is a typical CAPA workflow in QualityKick? Once a CAPA is created it gets the Created status. In this status you can keep editing the CAPA plan until it is finished, after which the creator changes the status to Under Signing by Approver. Once approvers have signed off, the CAPA is then put in the Implementing status. During this status, the CAPA responsible provides information about the CAPA execution. When done, the status is changed to Under Signing by QA, who then decides if it can be closed or if an effectiveness check is required. If that’s the case, the effectiveness check result needs to be logged before the CAPA can be closed. Note that when a change request is linked to the CAPA, then this change request is considered part of the CAPA plan. In this case the change request must be finished and closed before you can close the CAPA. Can I assign specific tasks to users for a CAPA? No, you can’t do that directly in the CAPAs module. This module has been kept simple in the sense that the CAPA plan is nothing more than a free-text field and so is the CAPA actions field which is filled in during the CAPA implementation phase. However, if you would still like to assign specific tasks to users you can do that by linking a change request to a CAPA, because the Change Control module does provide task creation, assignation and approval workflows. When a change request is linked to a CAPA, this change request becomes part of the CAPA plan and therefore, the change request must completely finished and signed off before the CAPA can be closed. Can I assign a due date to a CAPA? Yes, you can assign a due date while defining the CAPA plan. Additionally, when an effectiveness check is required, you can assign a due date for that particular effectiveness check. Can all users create and participate in a CAPA? All users, except for the read-only type of users, can create and participate in a CAPA as long as they have access to the CAPAs module. Can I upload file attachments to a CAPA? Yes, you can upload files to a CAPA during the implementation phase, as proof for implemented actions, and during the effectiveness check. On the CAPA detail page, you can find a convenient list of all uploaded files with an indication where the file was uploaded. Can I link a CAPA to some other CAPA which might have occurred in the past? Yes, you can link CAPAs to each other. But because not all companies found this useful, you can activate/deactivate this feature in the module settings page of the CAPAs module. Can I reopen a closed CAPA? No, you can’t. Once a CAPA is signed off and closed it cannot be reopened. In this case we suggest to create a new CAPA and link it to this closed CAPA for traceability purposes. Can I limit access to CAPAs? 1. You can limit access by deactivating access to the CAPAs module for a specific user. Users can only view and work on CAPAs if the CAPA in question is in a group to which the user has access.